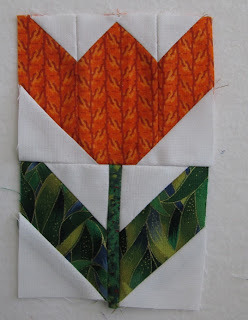 Spring is taking it's time around here so I got making my own Spring Tulips. I found the pattern for it at Bee in my Bonnet, it was the last row of her row by row. 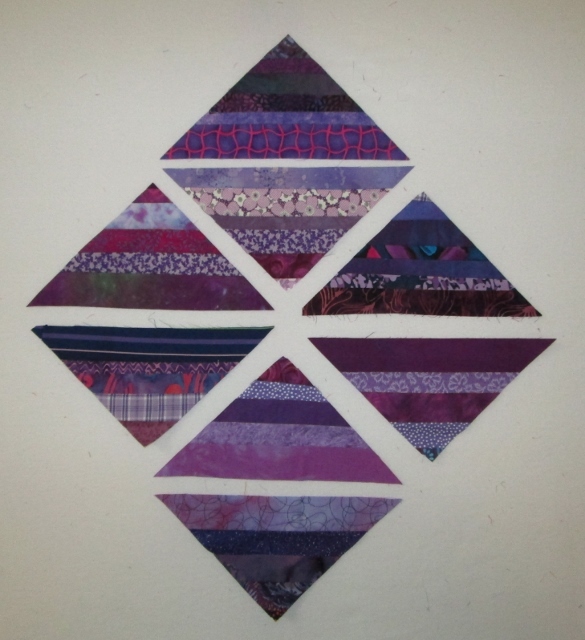 I just may have to make the whole quilt. I have made many of the butterflies and I love the apples and cores. These are just so cute. 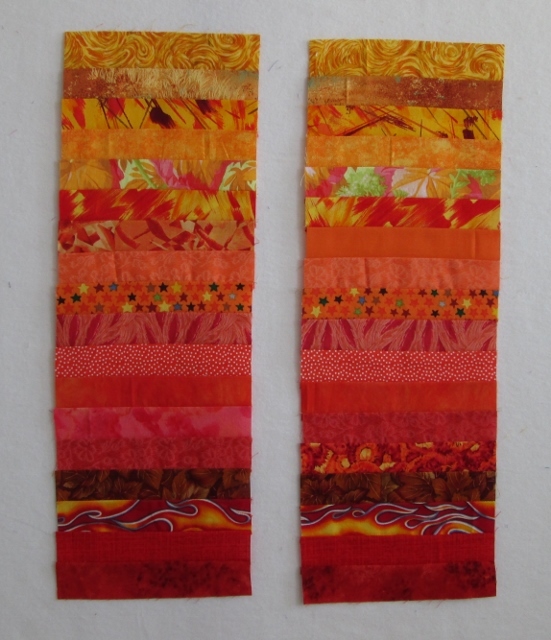 Next I sewed together some strips in orange. They are 6 1/2" wide. 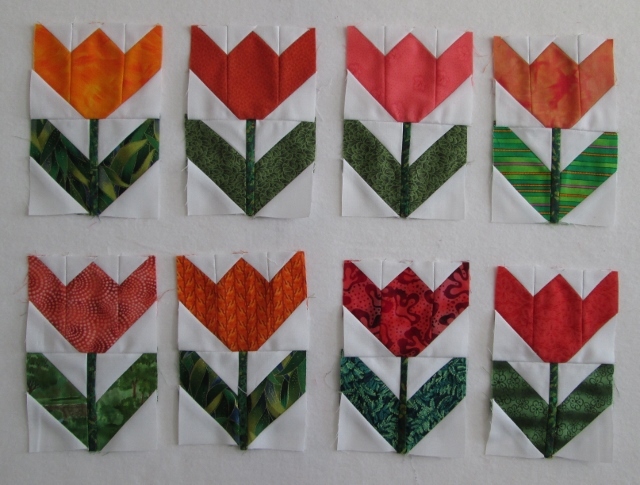 I am thinking they will be great as a boarder on one of these Rainbow quilts. For more on today's Orange scraps Go see Soscrappy. 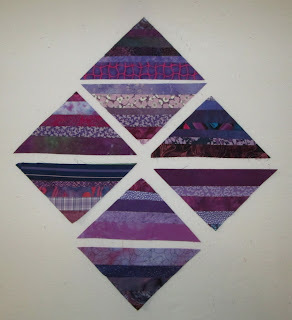 And to see more about the Rainbow Scrap Challenge 2013. I made five 6" crumb blocks to go with the others. I have trouble stopping these. I get started and there is always more little bits left that could be one more block. Then one more. Hard to stop. I still had a little stack of triangles so I made two 8" jack in the box blocks. I am thinking of going back and making a few pink and purple ones too. 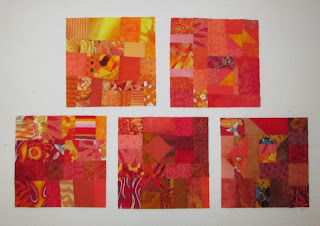 I still have a few strips so why not make a few string blocks. 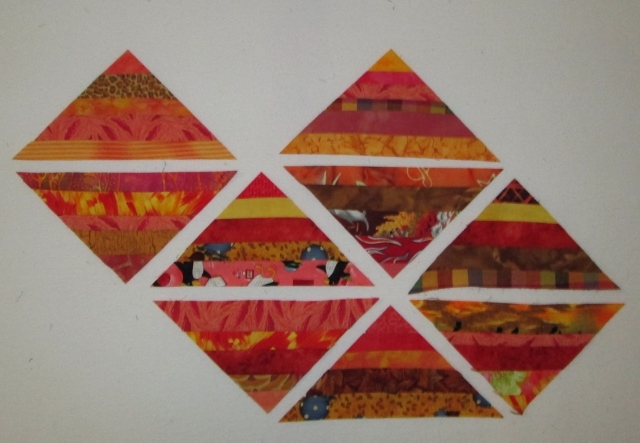 I decided to really make them triangles so that I can mix the colours up. I have no idea how I will really use them but they are more useful now. I went back and did some purple triangle strings too. I am not sure what size these are maybe 8" when two are sewn together. We have so much snow. I am thinking I may have to do some snow dying of fabric this week. The snow was so wet and perfect for snow dying yesterday. 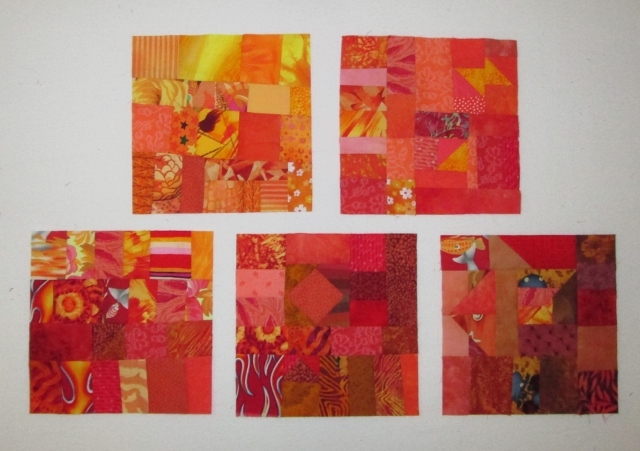 You have been so creative with your orange scraps! 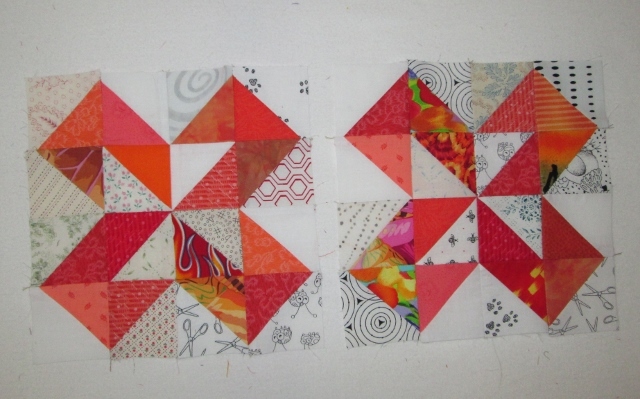 All kinds of pretty blocks. Love your oranges, Cathy, especially the tulips. How cheery! 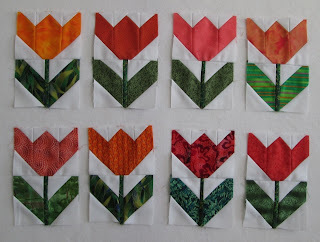 Tulips: if we can't grow 'em, at least we can sew 'em! Yours look great, Cathy! Those tulips are adorable. I was tempted by the row by row sew along at Bee in My Bonnet. All your colors are so pretty to look at! I think snow dying is the ultimate act of making lemonade from lemons. Love the flowers and the Jack in the Box blocks! So many projects and a great stash of orange bits to play with. I love the idea of the strips for borders and those triangles would be great as setting triangles for an on point setting! So smart to think ahead and have them ready. Oops. I especially love your orange flowers. LOVE the tulips, really pretty. Your orange flowers are gorgeous!